Below is a graph showing the biggest polluting countries in the world. 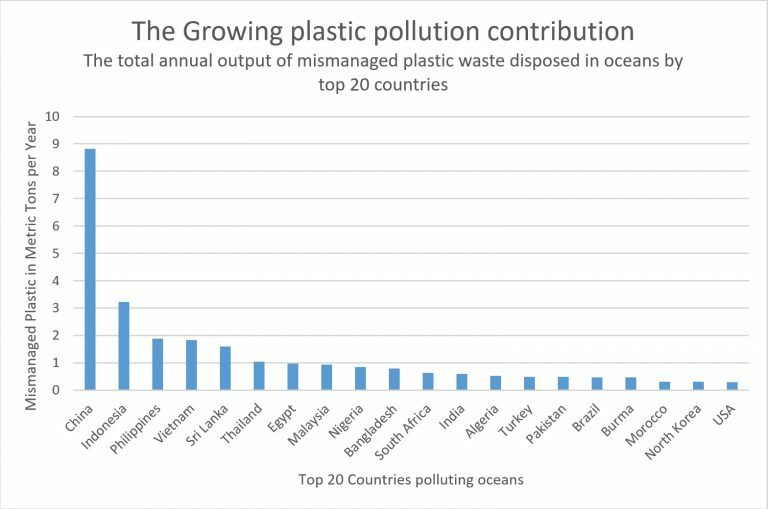 The top 5 represent approximately 60% of all ocean plastics. In many cases, a litre of bottled water is more expensive than a litre of petrol. Australia recycles only 36% of PET plastic drink bottles. Assuming the 582.9 million litres of bottled water produced in 2009-10 is in litre bottles, according to these figures, 373 million of those bottles will end up as waste. In South Australia , which has Container Deposit Legislation, the plastic bottle recycling rate is 74%. A 2007 national Newspoll commissioned by Clean Up Australia found that of those polled, 82% support a CDL scheme of 10c on bottles. Australia ’s annual use of bottled water generates more than 60,000 tonnes of greenhouse gas emissions – the same amount that 13,000 cars generate over the course of a year. Approximately 15,253.79 tonnes of PET (3) was used in the packaging of bottled water in 2009-10 (4). The manufacture of every tonne of PET produces around 3 tonnes of carbon dioxide (CO2). In Australia , bottling water has thus created more than 45.7 thousand tonnes of CO2 (5) in 2009-10, excluding the significant amounts of CO2 produced in the transportation and refrigeration of bottled water. Approximately 52.5 million litres of oil was used in 2009-10 to produce the PET used to package bottled water in Australia , excluding the energy used in transportation and refrigeration (6). More energy is used to fill the bottles, move them by truck, train, ship, or air, refrigerate them and recover, recycle or discard the empty bottles. The Pacific Institute estimates that the total amount of energy embedded in the use of bottled water can be as high as the equivalent of filling a plastic bottle one quarter full with oil. Therefore, more than 145.7 million litres of oil was used in the production, transportation, refrigeration and recycling/disposing of bottled water in Australia in 2009-10. This figure and the figures in the following three points are based on available Australian data on industry production and extrapolated using figures developed by The Pacific Institute for Studies in Development, Environment and Security. 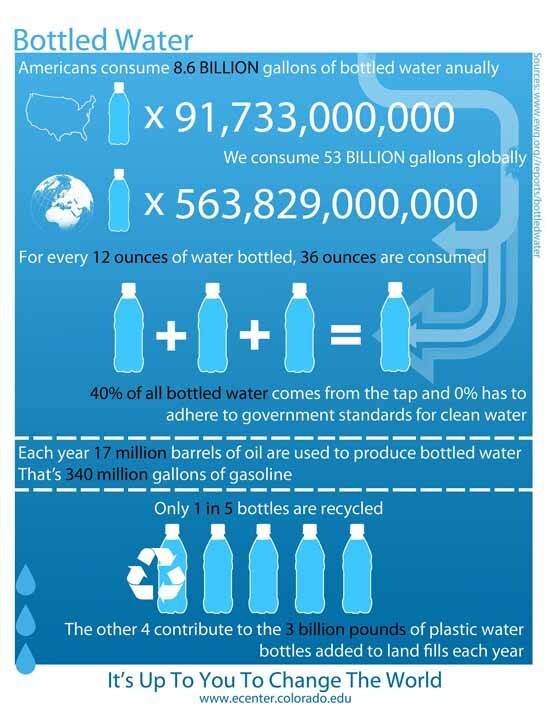 The extrapolations presented here should be read as an indicative guide to the environmental impacts of bottled water. According to The Pacific Institute, 816,466 metric tonnes of plastic is produced for 31.2 billion litres of water in the US. This is 0.000026168791 tonnes of plastic per litre. Applying this metric to bottled water production in Australia, 15,253.79 tonnes of PET was used in packaging of bottled water in Australia in 2009-10. Trackback: This Valentine’s Day – divorce yourself from single use plastics. – Helen Tandy – I'm fanatical about reducing plastic waste. Trackback: Our Planet Earth - . :Green Vibes:. Trackback: Join Labiotech's Team Challenge: Plastic Free July! Trackback: Preserve: 100% recyklovaný poklad, nebo nebezpe?ný experiment? Trackback: Where Are Plastic Bags Banned Around The World?? Trackback: The Zero Waste Movement | How you can play your part! Trackback: 4 Simple Hacks to Reduce Your Environmental Footprint - That Hippie Co.
Trackback: ????? ??????? ?, ??????? ??????? ?, ????????? ?? ???????? | ???????? ????? ???????????? ????????? ?